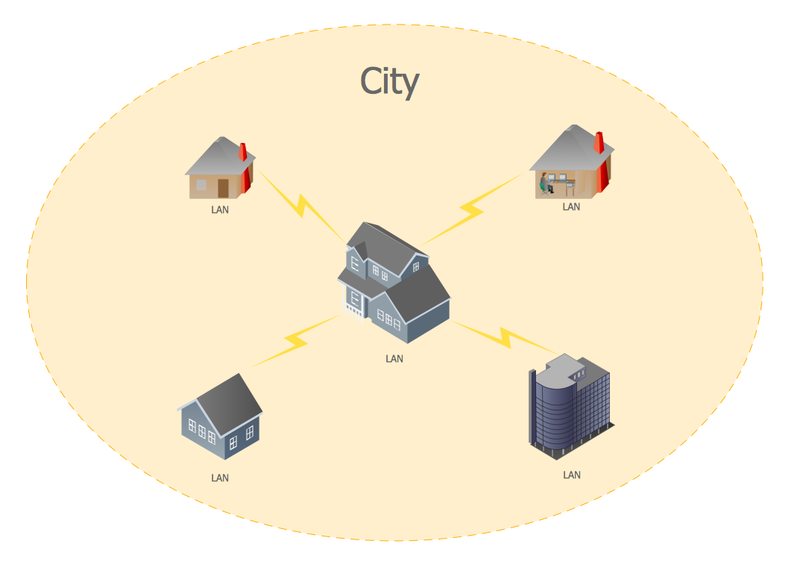 A Metropolitan Area Network (MAN) is a large computer network on the large geographical area that include several buildings or even the entire city (metropolis). The geographical area of the MAN is larger than LAN, but smaller than WAN. MAN includes many communicating devices and provides the Internet connectivity for the LANs in the metropolitan area. MAN is used to combine into a network group located in different buildings into a single network. The diameter of such a network can range from 5 to 50 kilometers. As a rule, MAN does not belong to any particular organization, in most cases, a group of users or a provider who takes charge for the service own its connecting elements and other equipment. Level of service is agreed in advance and some warranties are discussed. MAN often acts as a high-speed network to allow sharing regional resources (like a big LAN). It is also often used to provide public available connection to other networks using a WAN connection. There are many ways of classifying networks. The main criterion for classification is considering the administration method. That is, depending on how the network is organized and how it is controlled, it can be attributed to local or distributed, metropolitan or WAN. or her A network administrator manages a network or it’s segment. Administration team activities are logged, and their rights and responsibilities are strictly divided if the network is complex. Computers can be connected using a variety of media access controllers: a twisted pair, optical conductors (optical cables) and via radio (wireless technology). Wired optical connections are usually established via Ethernet, wireless - through Wi-Fi, Bluetooth, GPRS and other protocols. Private LAN may be linked to other local area networks through gateways, as well as being part of a global computer network (eg, the Internet), or have a connection to it. Computer and Networks Area for ConceptDraw DIAGRAM provides professional looking examples, the libraries with ready-to-use predesigned vector stencils to help you create anyone computer network diagrams quick, easy and effective. This example was created in ConceptDraw DIAGRAM using the Computer and Networks Area of ConceptDraw Solution Park and shows the Metropolitan Area Network. The MAN can be used to provide services including telecoms, Internet access, television and CCTV to businesses and citizens in these metropolitan areas. A network diagram is used to depict the topology of a computer network or, talking more broadly, any telecommunications network in general. In order for a computer network diagram to be understandable, clearly identifiable icons must be used for each network appliance. Cisco network templates, also called Network Topology Icons, is a brand of symbols developed and used by Cisco. Since Cisco Systems is the largest networking company in the world, it's list of networking symbols is widely recognized and exhaustive. The diagram of the ISG network topology diagram illustrates the Cisco Intelligent Services Gateway. Since Cicso company offers service providers a possibility to provide control of state and resources in a broadband network, network architects and engineers need some facilities to create ISG topology diagrams.This Cisco ISG network diagram was created in ConceptDraw DIAGRAM v12 using its solution for Cisco network diagrams. 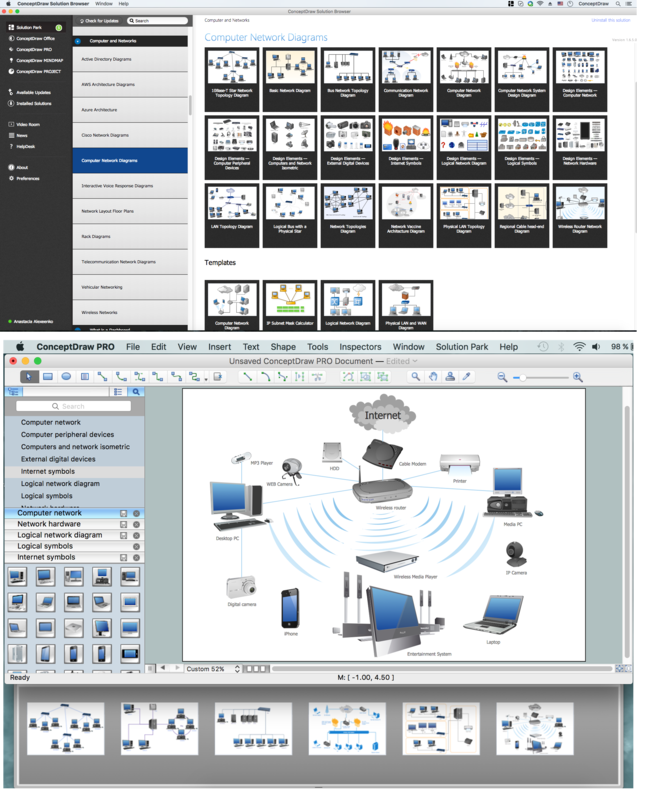 The vector library of this solution comprises over 500 icons of Cisco hardware and accessories. They can be used to design LAN, WAN, ISG and other Cisco equipped network diagrams. A Local Area Network (LAN) is a computer network that interconnects computers on the limited area such as a home, office building, school, bank, computer laboratory, etc. ConceptDraw DIAGRAM v12 is a powerful network diagramming and vector drawing software. It provides the Computer and Networks Area with many Solutions that contain the wide set ready-to-use predesigned vector stencils and examples to help you design the LANs quick and easy.